Energy carriers: gas, diesel fuel. Price: from 660 000 rubles, depending on the oven configuration and the quantity purchased. The POISK rotary oven provides high-quality manufacturing process for bakery and confectionery products made of wheat and rye flour. In our oven, a wide range of bread, bakery and confectionery products of the highest quality can be made. The air circulation inside the chamber and the adjustable steam generator provide uniform baking, high lift, a smooth color and gloss of the baking surface. The air circulation is adjusted in 6 points by so-called «curtains» in order to achieve the maximum uniformity. The oven is controlled by a convenient 7 inch touch panel. The standard set includes 100 most demanded baking programs allowing the manufacture of a wide variety of products fitting every taste. You can also create up to 1000 of custom programs with the adjustable technical specifications of each stage. All the information about technological processes is displayed on a convenient electronic display. The oven body is all-welded. This ensures the reliability and strength of its structure. A multi-layer heat insulation of the oven reduces the heat loss to a minimum and allows saving energy. A stainless bakery chamber serves as an additional screen that reflects the thermal energy. The unconditional advantages of the POISK rotary oven include the convenience and loading/unloading performance. The truck is loaded smoothly on absolutely flat floor, the difference is no more than 1 mm, which allows not to «stress» dough products. The truck goes into the gutter of the top drive, rises 20 mm above the floor and rotates. The top drive of the POISK rotary oven allows easily cleaning of the baking chamber. — changes are made based on the work of the Service Department every 3-4 months. — due to a certain design of the burner, special tubular heating elements and improved multi-layer thermal insulation of the oven body. — When the truck is loaded into the oven, there are no tremors, since the bottom of the baking chamber is located at the floor level. — The cleaning the baking chamber is simplified, because there is no rotation mechanism on the floor. — There is no need to disassemble the floor of the baking chamber for servicing the truck rotation mechanism. — designed in order to ensure an absolute smooth running without jumps and stops. — provides a sufficient amount of steam in the baking chamber. The quantity and the time of the steam supply are according to the set program. The steam generator is durable and resistant to corrosion and boiling. — made of special heat-resistant steel (thickness 4 mm) which has increased corrosion resistance. — based on the touch screen and allows setting more than 100 programs for producing various bakery products. — various types of bread forms (L7 and L10) are used on the same shelf truck. At the same time, the performance is not reduced. — that reduces and simplifies the cost of repairs. — moved beyond the limits of the heated zone and have a 3-4x marginal load capacitance. — Due to the fact that the development and manufacturing are carried out at one enterprise, which is actively working to reduce overhead and production costs in general, advertising costs are borne by other enterprises of GC “Yugprodmash”. — provides the significant durability and the absence of the loosening effect (fixing elements weakening), as distinct from frameless ovens assembled from panels which are fastened with screws and wedge joints. — has an increased coefficient of heat transfer, which helps reducing the rated electric power of tubular heating elements or the burner power. — the demountable model assembly takes place at the customer’s facility, which allows the oven installation in rooms with small dimensions of technological openings. — the ovens are loaded both using a forklift and a crane or a crane beam. For that, they are equipped with appropriate lifting ears. The unconditional advantages of the POISK rotary oven include the convenience and loading/unloading performance. The truck is loaded smoothly on absolutely flat floor, the difference is no more than 2 mm. Five-layer walls of the oven reduce the heat loss and save the energy. 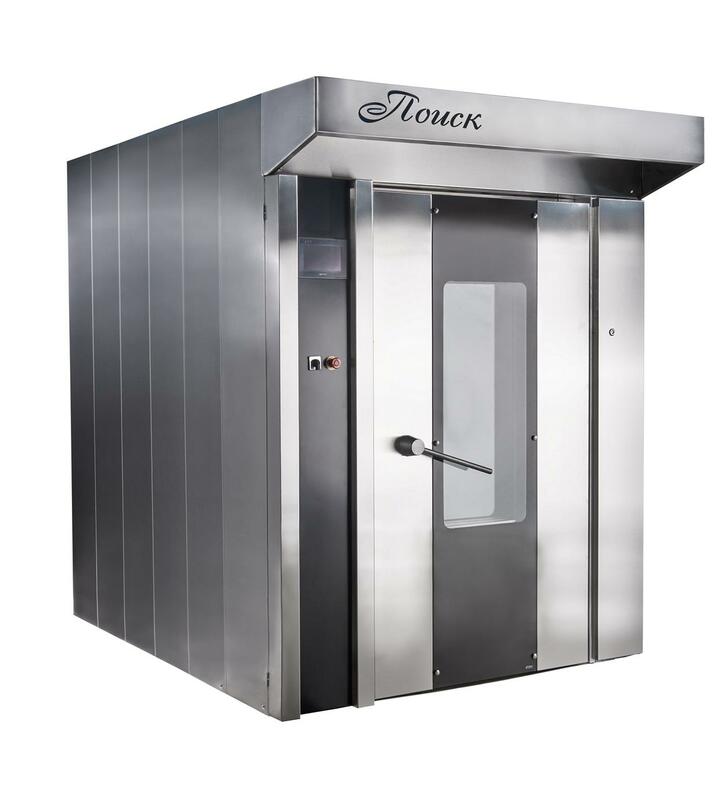 The air circulation inside the chamber and the adjustable steam generator provide uniform baking, high lift, a smooth color and gloss of the baking surface. The oven is operated using a convenient control board. The standard set includes 10 most demanded baking programs allowing the manufacture of a wide variety of products fitting every taste. You can also create up to 100 of custom programs with the adjustable technical specifications of each stage. Shelf truck (used for forms L7 and L10 of the section (of 5 pieces), optional. Details can be specified by phone (8634) 311-832 or through ordering a call back at a time which is convenient for you, simply by pressing the button «Order a call back» at the top of the page or by clicking on the handset in the lower right corner, leaving your contact phone number if you want to be called back during a few seconds. Our manager will advise you on all issues related to POISK rotary ovens. LLC PKP «BAK» provides its customers with reviews from operating bakeries and bread-baking plants on the supplied bakery equipment. We guarantee the quality and reliability of POISK rotary ovens by LLC PKP «BAK».